I witnessed a strange phenomena today, that nearly made me cheer in the street. But I live in Pontcanna, so we don't cheer in the street, we don't whistle in the street and we certainly don't talk on mobile phones in the shops. We do speak in welsh very loudly in the street but that is the subject of a future blog entry, no-doubt. On my way to the post office / corner shop, I was faced with a wall of traffic wardens marching down the pavement. There were two of them. They had that strange body shape, haircut, accent and swagger which made me unsure which gender they were - one of each, or perhaps two of both? They were about they usual business of slapping love letters on strangers minor indescretions, when they happened on a large black van. The van was clearly on double yellows - all of it, not one wheel, not the overhanging bumper, the whole kit caboodle and more. Andy: (Points at van) Do you suppose the fine ladies and gentlemen of Torchwood are still working hard to save our streets from malicious extraterrestrial adversaries? Hermi: (looks at watch) I should suppose they are, at present, allowing themselves a much deserved rest and are taking a little luncheon at a local bistro. Andy: Why of course, I shouldn't wonder they are. Hermi: Whats more, we should be vigilant that no miscreants interfere with the vehicular transportation. Andy: I should say! Let us return in one hour, to assure ourselves of their safety. Off they tottered! 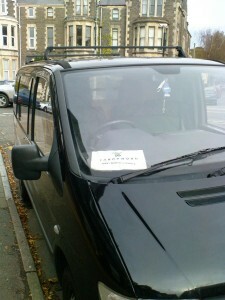 No looking back and more significantly, no parking ticket! The moral of this story is, download the torchwood logo and print out a sign that says cast and crew. You can have your choice of the prime parking spots around the city!